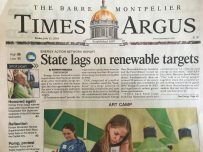 Energy Action Network’s recent report states that Vermont will fall short of its renewable energy targets if we continue with the status quo, but that opportunities to grow the state’s economy are waiting in the challenges of meeting those targets. If “business as usual” prevails, the organization’s projections show the state meeting less than 40 percent of its energy needs with renewables by 2050. EAN, comprised of a staff of three, considers itself the “backbone” of a large network of businesses, nonprofits and state agencies dedicated to fulfilling the commitments laid out in the Vermont Comprehensive Energy Plan, Renewable Energy Standard, and the Paris Climate Accord (as well as statutory predecessors to those). Fundamentally, these are to meet 90 percent of the state’s energy needs with renewables by 2050, hitting 25 percent by 2025, and significantly reduce greenhouse gas emissions. A key part of that role is objectively watching three energy sectors — electric power, transportation and thermal (mostly heating) — where the state can improve reliance on renewables and decrease emissions with technology that already exists. EAN does not take policy positions in an effort to remain neutral in their aggregation and analysis of officially sourced data for their members. So, what does progress look like in those sectors and where does the local economy come in? Transportation and thermal, primarily heating, are two high-impact drivers toward the first milestone of 25 percent renewable energy in 2025. The report stresses the need to “bend the curve” in the next seven years in order for the state to meet the 2025 benchmark, identifying 10 pathways, which together will get Vermont on its way to achieving those goals. In the transportation sector, adding 60,000 electric vehicles (the current count is 2,300), increasing fleet fuel efficiency by 5 percent (from the present average of 22.2 mpg) and doubling ride-share van pools (currently 18 percent of commuters participate), is what’s needed. According to the report, Vermont has more electric vehicle charging stations per capita than any other state (including California — 60 percent more than the Golden State) with more than 165 public stations and more coming online. In the thermal sector, EAN’s report calls for increased energy efficiency weatherization, specifically completing 60,000 more building retrofits (currently at 23,397), adding 25,000 more advanced wood heat systems (including efficient pellet stoves, boilers and institutional wood chip systems), and heating 60,000 more buildings with cold climate heat pumps (current count is 10,500). Duval’s previous work as economic development director for the state’s Agency of Commerce and Community Development, providing business support to working lands and green economy businesses throughout Vermont, has given him particular insight into the state’s need for a low-grade wood demand. He’s not alone in feeling this is a moment to seize upon for the state’s economy. “Depending on the price of fuel, roughly 78 to 80 cents of every dollar we spend on fossil fuels leaves the state, because it’s all imported. I think there’s multiple benefits from wood pellet heating in that you reduce emissions, displace fossil fuels for renewable energy, but you also keep forests forested. Our forest economy suffered with the decline in pulp and paper mills. Much of the forest in Vermont is privately owned, and without a market for healthy, sustainable harvests of low-grade wood, the risks are sell-offs and forest fragmentation, which has been a concern in the state for some time,” he said. They also point to the fact that the Vermont clean energy sector has been the fastest growing job sector in the state with a total of 19,080 jobs in 2017, up 29 percent since 2013. A July 2017 report by the Biomass Energy Resource Center at the Vermont Energy Investment Corporation emphasized the role of the advanced wood heating sector in the advancement of our renewable energy goals. That report states that while currently in the early stages of market development, advanced wood heat was already contributing to Vermont’s economy through jobs and sales revenue from installers, producers and distributors around the state. The final pathways EAN identified are: An additional 260 megawatts of solar (currently 299 megawatts), 115 more megawatts of wind power (currently 241 megawatts), adding another 50 biodigesters to the current 18, and increasing best management practices for agricultural soils in the state. EAN’s biggest takeaway is that there isn’t a single solution.